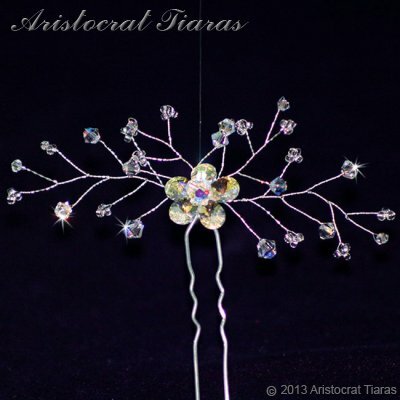 Lady Lyra flower hair pin from Aristocrat Tiaras centres on a electrifying flower made from pear drop and round Swarovski crystal AB beads with a spray of sparkling crystal AB and seed beads. This hair pin will enhance any bride's hairstyle on her wedding day and will sparkle amazingly under any light. The price is for one hair pin and you can buy as many hair pins as you need to complement your hairstyle. All our bridal tiaras and hair accessories are handmade in Herefordshire UK. Colours and designs may vary slightly from the picture. Ready to ship! This hair accessory could be with you by 1pm Saturday 20th April (tomorrow).